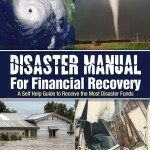 Don’t think you can get more money from FEMA by exaggerating the extent of your damages or working a deal with a CFI. Fraud from Hurricanes Katrina and Rita totaled more than one billion dollars. Even with the established penalties of a quarter-million dollars in fines, jail time, or both, fraudsters still take chances. Because of the enormity of the fraud in these hurricanes, the National Center for Disaster Fraud was started. This group relentlessly pursues open cases, and it may take them years but someone who made a fraudulent claim will be pursued to the greatest extent possible. You might not even know you’ve been discovered until you file annual income tax and receive a letter informing you that all future tax refunds are being withheld. The fallout from Hurricane Sandy is still being painfully felt by New Yorkers who are being faced with demands for the return of their FEMA money. See more in this NY Post article from the last quarter of 2014. And check out this NJ woman’s story. Don’t find yourself delivered into evil. Fraud hurts everybody but no one worse than yourself.